The footage, released by the ar-Raqqa media wing of IS, depicts the group's militants roaming the town, shooting machine guns at unidentified targets, and destroying buildings and other infrastructure in and around Kobani, which they call "Ayn al-Islam" (‘Spring of Islam,’ a play on its former name, ‘Spring of the Arabs’). 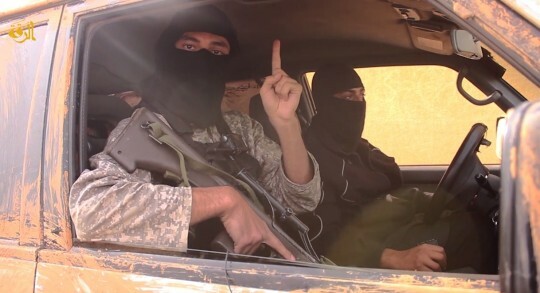 "We will not give up control over the areas courted by the Kurdish parties," a masked IS militant said from the passenger seat of his vehicle. "And, by God's permission, we will purify Ayn Al-Islam of the Kurdish parties, and the supporters of the PKK, and the supporters of the Peshmerga, and all of the Free Syrian Army." The masked militant then spoke to President Obama directly, calling the United States the "base of injustice" and claiming that paradise awaits those killed in coalition airstrikes. "So as the airplanes gather in number, so too does the judge (God) gather a number of promises for God's fallen soldiers, for God is the greatest," the masked militant said. The video comes as the U.S.-led coalition focuses its airstrike campaign on Raqqa, the self-declared Islamic State ‘capital' in Northern Syria. Kobani, meanwhile, remains under siege as IS militants attempt to mount suicide attacks from inside the Turkish border. On Sunday, Syrian Foreign Minister Walid al-Moualem claimed that after two months of coalition airstrikes, IS was "not weaker." This entry was posted in National Security and tagged Free Syrian Army, Islamic State, Syria, Turkey. Bookmark the permalink. Sam Taylor is a Media Analyst at the Washington Free Beacon. He can be found on Twitter @Tex_Taylor.